Is slow internet making your life hard in Elanora? We use internet for nearly everything in our daily lives; we use it in our cars and our businesses, our home life and to book holidays, in fact, if you imagine a day without using internet, you'd probably have a very hard time getting through the day. So it's not hard to understand how frustrated and inconvenienced you must be right now if your internet isn't working properly, but don't despair...there is hope. No Internet Problem too Big! I'm your local Internet Magic technician Doug and I specialise in all your internet needs. Slow internet is no match for Internet Magic's expertise and experience in getting you the very best internet solutions fast. Whether you are a bussiness person with an important seminar to prepare for tomorrow, a student trying to get an assignement done, or someone trying to book cheap flights overseas, you will be very affected by how fast or slow your internet is working. I Just Can't Get Fast Internet; I've Tried Everything! Although many people are quite smart in most areas, not everyone can know everything about how the internet works, or doesn't work, but that's why I'm here. Although you may have been told by others in the past that you just can't get fast internet in your area, this may not be true. There are methods of getting around the difficulties of being in a remote area and trying to get internet, but few people know how to help you out in this situation, so why not let me put your mind at ease and let me help you get the internet connection that you've always wanted.? 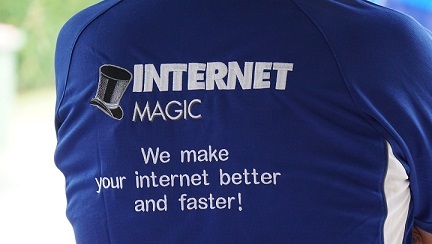 Call me today at Internet Magic Elanora!